Plus the Lake Merritt neighborhood gets a deli, Grand Lake Kitchen. The waffles are served with real syrup. Good news for Temescalians: For the past several Mondays, Beauty's Bagel Shop (3838 Telegraph Ave., Oakland) has played host to a chicken-and-waffles spot called Ronca's Kitchen — a new pop-up enterprise serving legitimately tasty waffles and a Bakesale Betty-worthy fried chicken sandwich you don't have to stand in line outside for. Ronca's is the brainchild of Ingrid Ibarra, a St. Helena-based personal chef, and her daughter Julia Ibarra, who is a friend of Beauty's co-owner Amy Remsen. Since the bagel shop is normally closed on Mondays, and since it is already equipped with a fryer, the Ibarras saw this as the perfect opportunity. Julia Ibarra said her mother drew inspiration for the chicken-and-waffles concept from Thomas Keller's Yountville restaurant, Ad Hoc, which is famous for its high-end Monday-night fried chicken dinners and which occasionally serves chicken and waffles for Sunday brunch. ("Ronca" is the mother's nickname — a Spanish endearment for someone with a deep, loud voice.) Ronca's serves chicken sandwiches and waffles for lunch (11:30 a.m. to 3:30 p.m.) and fried chicken with waffles, coleslaw, and corn bread for dinner (5 p.m. to 9 p.m.). In addition, the pop-up serves a vegetarian fried "chicken," made from a textured soy product from the Layonna Vegetarian Health Food Market (Oakland Chinatown's fake-meat emporium), that Ibarra said tastes "just like real chicken." "I'm definitely not vegetarian, and I almost always get it," she said. 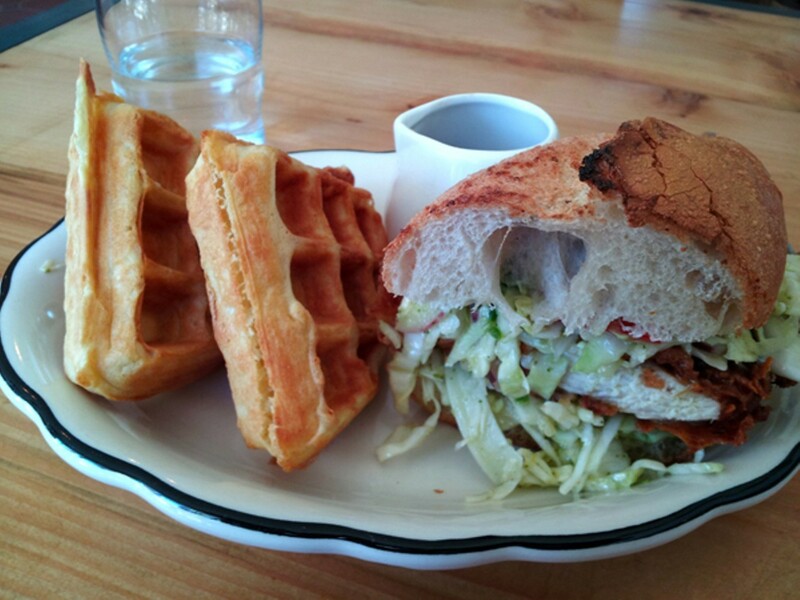 There are also a savory prosciutto waffles and seasonal waffle specials. When I had lunch at Ronca's a couple weeks ago, I ordered a half-and-half combo ($9.75), which came with a waffle and half a sandwich. The sandwich falls roughly into the Bakesale Betty school of fried-chicken sandwiches, with crunchier bread (an Acme torpedo roll): Here, too, you get a lightly battered boneless breast and a vinegar-based cabbage slaw. Ronca's uses Mary's Organic chicken that's brined for several days, and the slaw has a pleasant, lingering heat. The waffle, on the other hand, had a satisfying heft to it — dense and chewy and a completely different animal from, say, the light-as-air version everyone goes crazy for at Brown Sugar Kitchen. 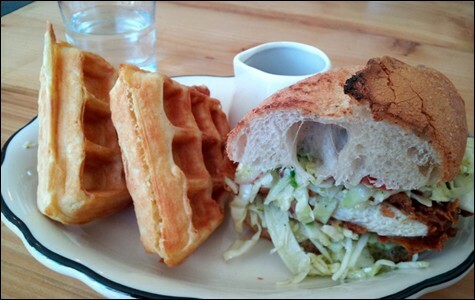 Ibarra said the style is similar to a Brussels waffle, characterized by its crispiness and large pockets. All waffles are served with organic butter and a side of Vermont maple syrup — a nice bonus — unlike, ahem, at certain other waffle purveyors in town, where there's an upcharge for real maple syrup. Two weeks ago, Oakland's Lake Merritt neighborhood welcomed the newest addition to its ever-improving dining scene: a deli called Grand Lake Kitchen (576 Grand Ave.). It's the first restaurant venture for husband-and-wife owners Dave Wasem and May Seto — previously, Wasem was sous chef at San Francisco's Park Tavern; Seto was general manager at Delfina and Pizzeria Delfina, also in San Francisco. According to Seto, Grand Lake Kitchen is neither an old-school East Coast deli nor a traditional Russian-Jewish deli. "We try to have a little of everything for everyone," Seto said, pointing out that the menu stresses local and seasonal ingredients but also includes traditional deli items like an old-fashioned potato salad. The overall concept was rooted in what Seto and Wasem saw as a lack of "fast and delicious" options in a neighborhood largely populated by sit-down restaurants. "So [the restaurant] was actually born out of the two of us being hungry," Seto said. One of the most prominent features of the place is a deli case full of interesting salads and other prepared foods: an escarole salad with capers and Castelvetrano olives, and a non-vinegary macaroni salad with tuna and mayo. As for the sandwich menu, Seto said she and Wasem are especially proud of a cheddar bratwurst sandwich (featuring 4505 Meats sausage and pickled red onions) and the "Oyako," an open-faced egg salad sandwich topped with mache and crispy chicken skin. I've tried both — the former was tasty; the latter immediately moved near the top of my personal pantheon of all-time great egg salad sandwiches. The deli also has a small grocery section stocked with house-made pickles and granolas and a carefully curated selection of healthful snacks. Beer and wine are also available. The project has been in the works for some time now, previously under the name "La Grande Jatte Kitchen." Seto said the construction process ended up taking nine months, as she and Wasem had to install a full kitchen in what had been an office space. The completed restaurant boasts a twelve-seat diner-style counter and a handful of seats out front — good for people-watching on Saturday, when the nearby farmers' market is in full swing. The location is also fortuitous in that it's just a few steps away from Gold's Gym — lots of foot traffic, and lots of folks looking for a quick post-workout meal or snack.